Preheat the oven to 425 degrees. In a saucepan, combine the liquid aminos, coconut nectar, water, garlic, ginger, rice vinegar, lime juice, and sriracha. Heat over medium until the mixture simmers. Remove from the heat and whisk in the cornstarch mixture. Return it to the heat and bring it back to a simmer, stirring constantly. Set aside. 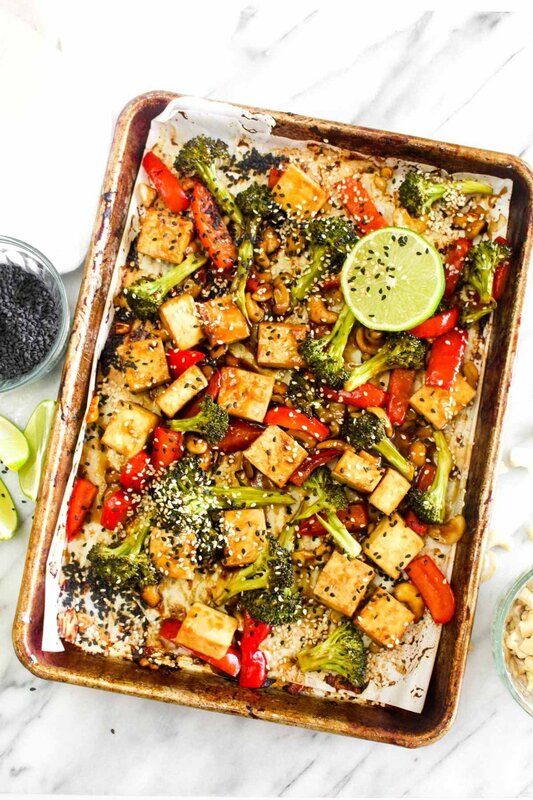 Arrange the tofu and veggies on a sheet pan lines with nonstick foil. Pour over the sauce and sprinkle on the cashews. Toss to coat. Bake for 15 minutes, give everything a good toss, and bake for another 10 minutes or until the veggies are tender. Serve over rice if desired.